Being a midlife blogger means I get to write about stuff like bladder weakness. Don’t get me wrong – I’m all for breaking down taboos and raising awareness of women’s issues. But when I got a blogger pack from TENA Lady I was wondering how it related to me and how I could write about it truthfully. Then something happened in my home town which made me think about bladder weakness in a different way. Every October, for over 700, years a travelling fair comes to Hull. It’s one of the biggest fairgrounds in Europe and the rides are incredible. The annual pilgrimage to Hull Fair starts when locals are very young and makes them a pretty fearless lot. 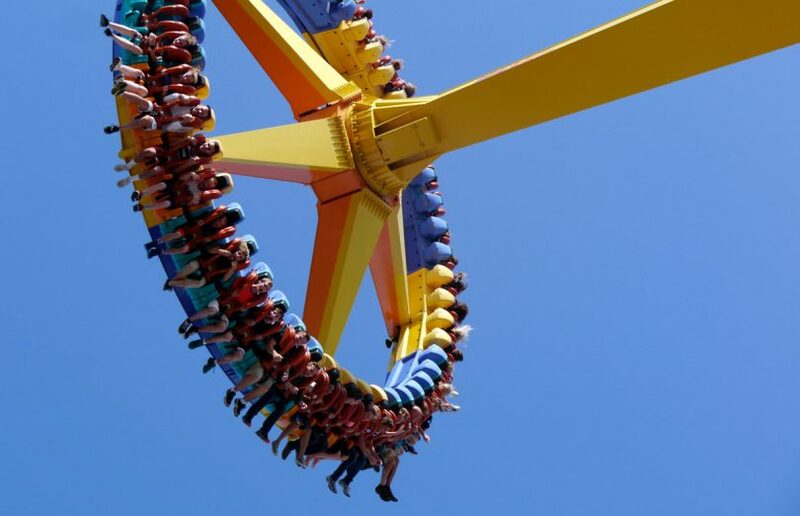 But this year the Power Tower ride broke down leaving 32 people stuck 50ft in the air. They sat, waiting to be rescued with their legs dangling, for six and a half hours. All I could think of was how much they must have wanted to pee. I am not saying these people suffered with a weak bladder but the experience of wanting, needing, to pee in a public space was something I could relate to. The total embarrassment, the horror of the situation, makes me cringe. If you suffer from bladder weakness that must be how you feel every time you leave home. I am only 54 and I never gave birth so I don’t have a weak bladder. Not yet! I’m hoping that my pelvic floor will hold up for the foreseeable future. That said, when I got on a friend’s trampoline a few summers ago I had a little bit of ‘leakage’ and quickly got off. So I can imagine, sitting above the fair, how reassuring it would have been to be wearing protection. TENA Lady have introduced Pants Plus to provide just that – ultimate protection for women suffering from stress incontinence. The pants were launched with this advert which shows a mature bride zipwiring through a forest. She gracefully trails gossamer as she dives nymph like into the arms of her beloved. Of course she’s wearing TENA Lady Pants Plus and frankly so would I if I was getting hitched in the tree tops. 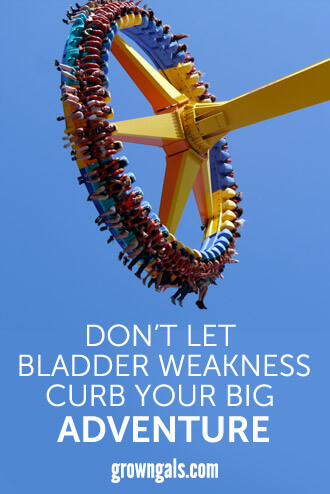 The message is loud and clear – do not let a weak bladder define you or stop you enjoying life’s big adventures. Part of TENA’s blogger package was the chance to ‘Go Ape’ for ourselves. Presumably wearing the said pants. I’m still thinking about it but I might try a dance session instead. I probably won’t wear the pants for a salsa class but I thought you would want to know how they fit. The answer is that they feel very secure and no more cumbersome than a sanitary pad. To prove the point this is a picture of me holding plank position in leggings and wearing Pants Plus. Really. A bit of leakage when you laugh, cough, sneeze, walk, exercise or lift something is a sign that you too might be developing stress incontinence. It is estimated that worldwide, 400 million men and women live with bladder weakness. It is much more common than you imagine. After childbirth, in particular, many young women experience stress incontinence. One thing you can do is to practise these pelvic floor exercises to strengthen the muscles. I also found an excellent Good Housekeeping article which was very helpful when researching this post: 14 things you always wanted to know about bladder weakness. Lastly you might be interested in one of my previous posts: tips for menopause, midlife and a leaky bladder. It’s time we broke down the taboo of talking about incontinence so please share this post. As for Hull Fair – I’ll be packing a pair of Pants Plus next time I visit.